Home body drink fat health news useful water weight loss How Much Water You Should Drink for Your Weight? Drinking plenty of water is crucial for the health. It can improve your health and help in the weight loss process. Drinking the right amount of water on a daily basis is extremely important as it will boost the metabolic rate and prevent overeating. What you should know is how much water you should drink a day for both health and weight loss benefits. The amount of water you should drink depends on your weight. For instance, a two hundred pound man and 100-pound woman require different amounts of water every day. In the next step, you should multiply your weight by 2/3 (or 67%). 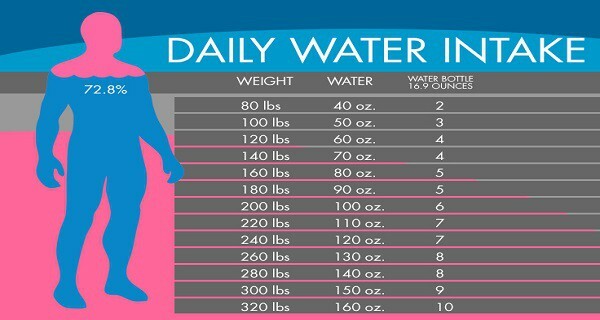 This will help you determine how much water to drink daily. So, if you weighed 175 pounds you would multiply that by 2/3 and learn you should be drinking about 117 ounces of water on a daily basis. Then, you should also have in mind your activity level or how much you work out. Hence, you should add 12 ounces of water to your daily total for every 30 minutes that you work out. Moreover, if you workout for 45 minutes daily, you should add 18 ounces of water to your daily intake. In order to simplify the process, below you can find the recommended amounts for a range of weights. Just make sure to adjust for your activity level. Incorporate the habit of drinking one glass of water as soon as you wake up and just before you go to bed. Simply keep a container of water near your bed. Make sure you drink 2 cups of water before every meal. This will help you lose some weight and reduce the appetite. You should have a special container fro your water. This will help you keep track of the water you consume on a daily basis. In order to make water tastier and more fun, you should infuse it with fruit, herbs, and other flavors. Choose some cucumber, strawberries, lemons, limes, and fresh herbs. You can also consume carbonated and sparkling water. You should consider it as an addition to regular water.